As simple to use as e-mail! Text-enable your business phone numbers to communicate with policy holders and prospects. Easily send payment and renewal reminders, and invitations for insurance check-ups, and also with MMS you can send documents and pictures. You can include keywords in your marketing campaigns to reach new potencial customers. Additional features include logging, reporting, and an instant search. We initially used MessagePro Office for simple reminders to policy holders for routine items. However, we have found it to be very effective for business development as well. By far the biggest payoff is the increase in efficiency and morale of our employees—demanding they make 50 plus calls a day is a nice objective but with almost 80% of calls not answered—well, they never hit 50. It’s still a top-end target but we know that texting has a multiplying effect on our communications productivity. 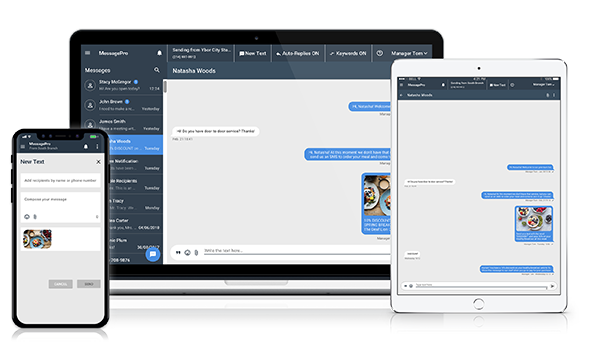 Want to Know More About MessagePro for Insurance Agencies? Let’s Talk!